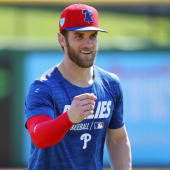 Franco is not in the lineup Sunday against the Braves, Jim Salisbury of NBC Sports Philadelphia reports. This will be the seventh game in a row Franco will miss after sitting out much of September with a plethora of injuries. Assuming he won't make a pinch-hit appearance, the 26-year-old will finish the season with a .270/.314/.467 slash line, a vast improvement from last season. Carlos Santana will man the hot corner in his stead.